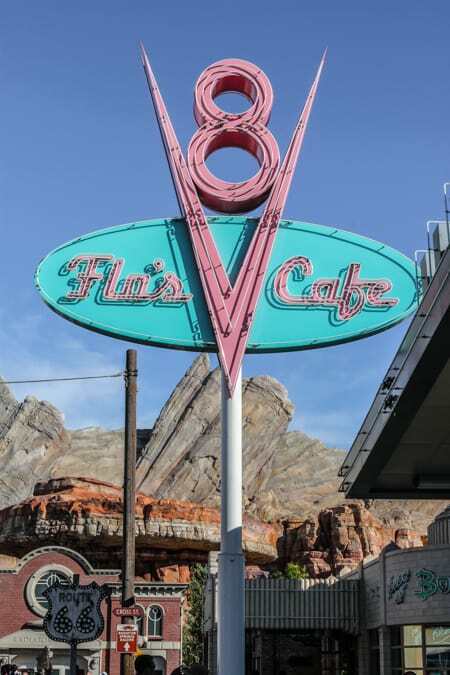 Disney’s Flo’s V8 Cafe is nestled next to the popular Radiator Springs Racer ride in Cars Land at California Adventure. 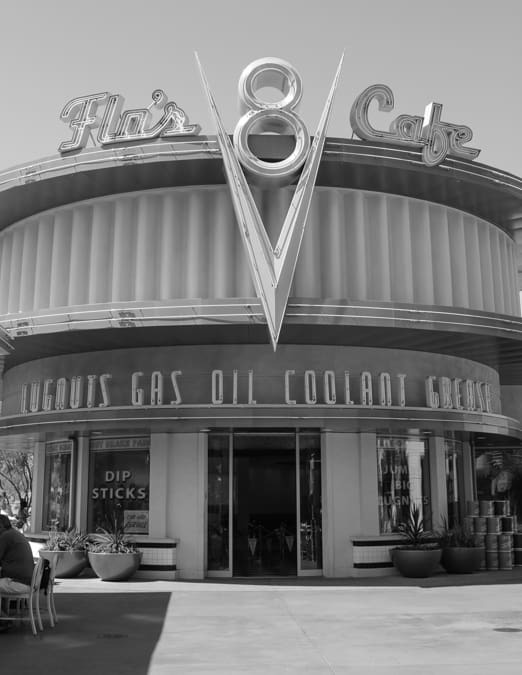 They brought the movie to life with their old time feel and old time menu. The pastel colors are a treat to the eyes. A shot of the front porch eating area. Cute decor as you enjoy a meal. 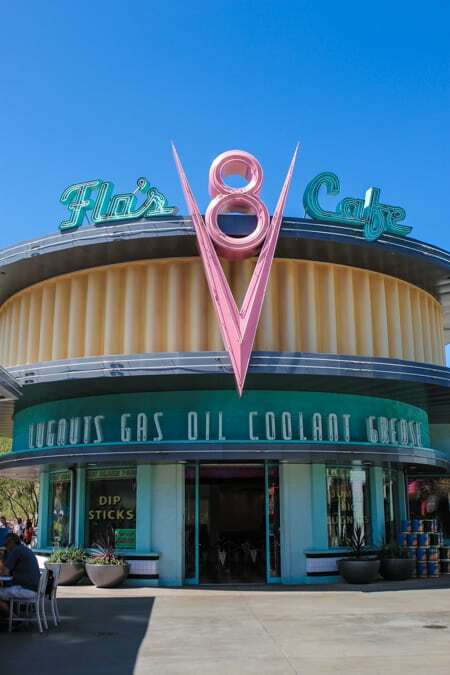 Flo’s V8 Cafe doesn’t seem to get too busy. 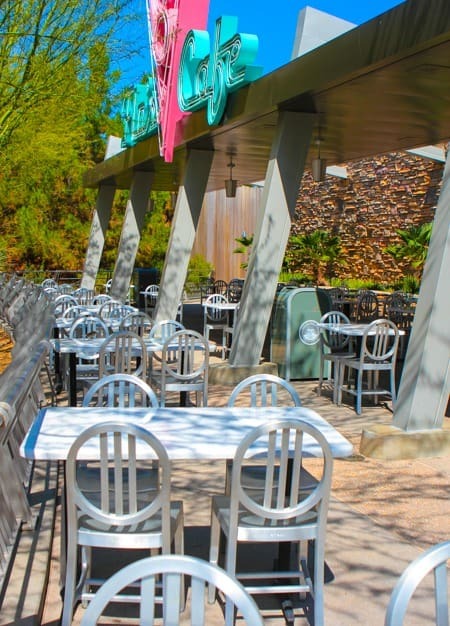 You can generally walk right up to a cashier, place your order, then move to the delivery counter in typical Disney fashion. 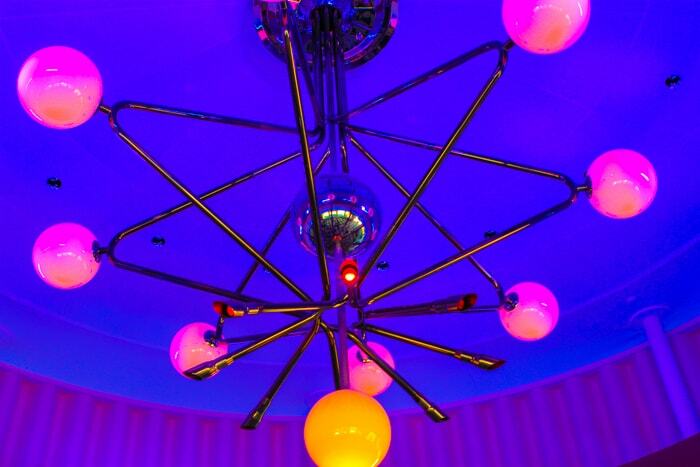 The chandelier in the main entrance foyer. 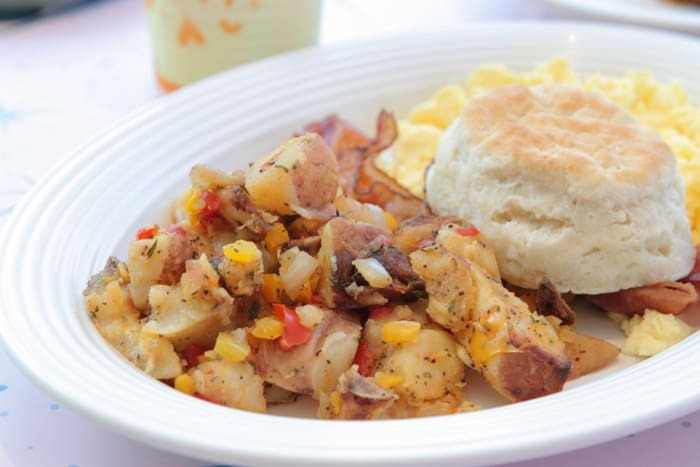 Their breakfast menu is simple; designed for a quick breakfast selection. You can buy a standard fruit dish. 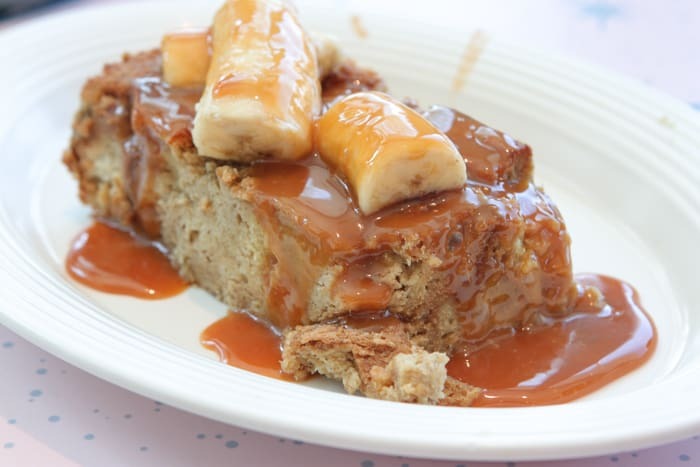 The miniature oat bran muffin left us wanting 2 or 3 of these. Aside from the imprinted disney symbol, these children’s waffles ($6.49) are not impressive to look at. However, there is something unique in their waffle mixture. 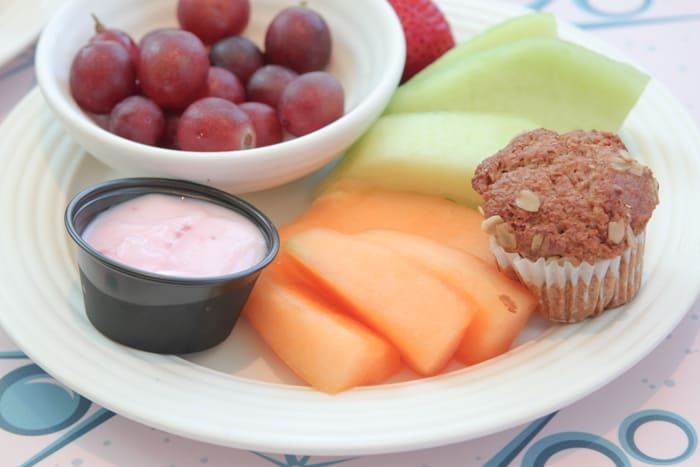 We were told by a staff member that they use Buckwheat, which is a fruit seed related to rhubarb and sorrel and not wheat, as one would initially think. Buckwheat contains a good amount of flavonoids which protect against disease. 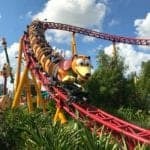 Props to Disney for choosing a better waffle mix. 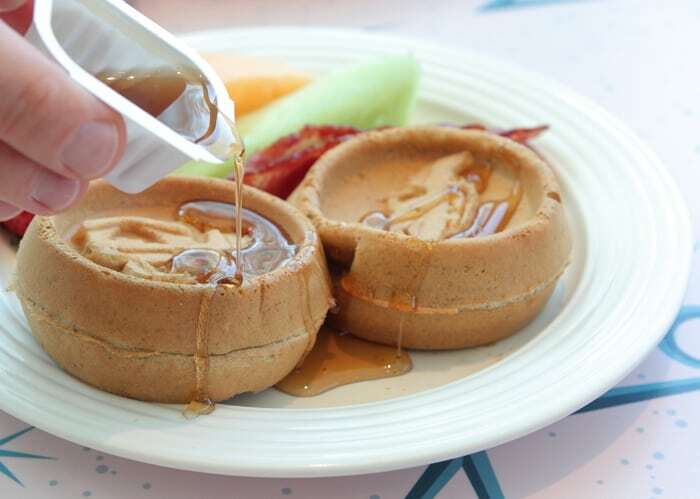 If you ask us, these waffles taste much better than they look. 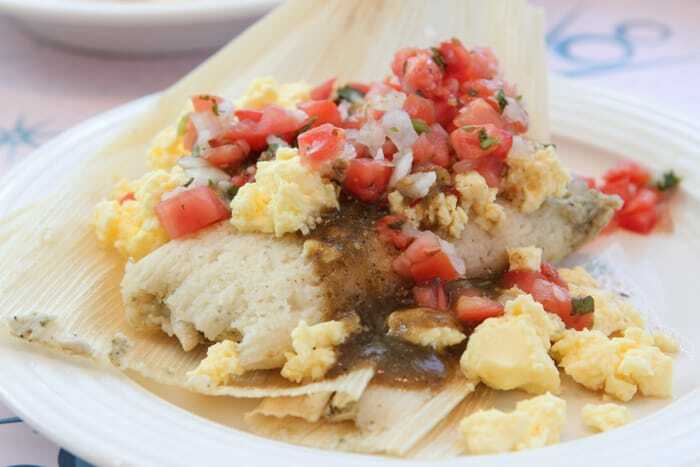 This dish–Chicken Tamale Breakfast ($7.99)–was our favorite breakfast item. The salsa provides the right kick to get your morning started–assuming you’re not already on a high from a cup of coffee. 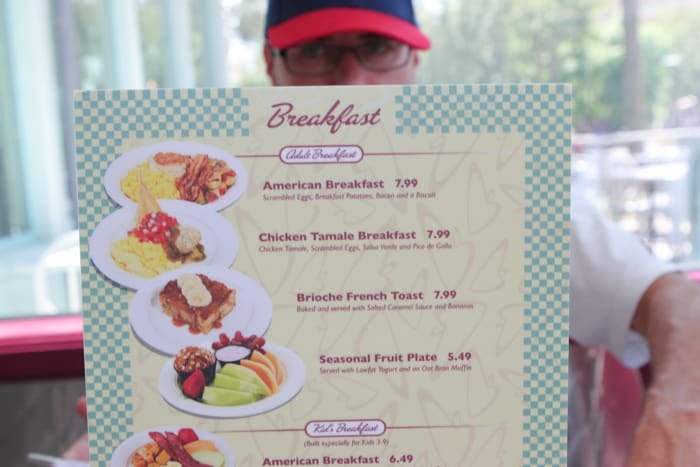 The American Breakfast ($7.99). Not our favorite of the bunch. 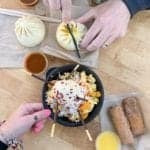 Potatoes are flavorful but just ok. The eggs were lacking seasoning. Is this Brioche French Toast ($7.99) dessert or breakfast? If you’re one to blur those lines, make sure you order this dish as it didn’t disappoint. In fact, we ordered two for our group. 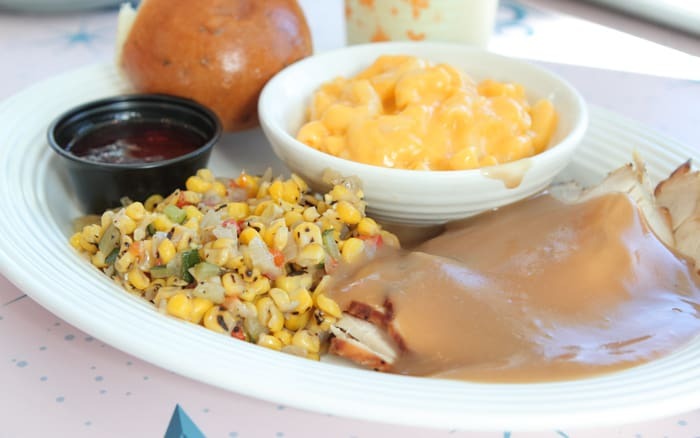 Also, if your kids are like ours, ask for the gravy to come on the side. It was a turn-off for our two picky eaters. 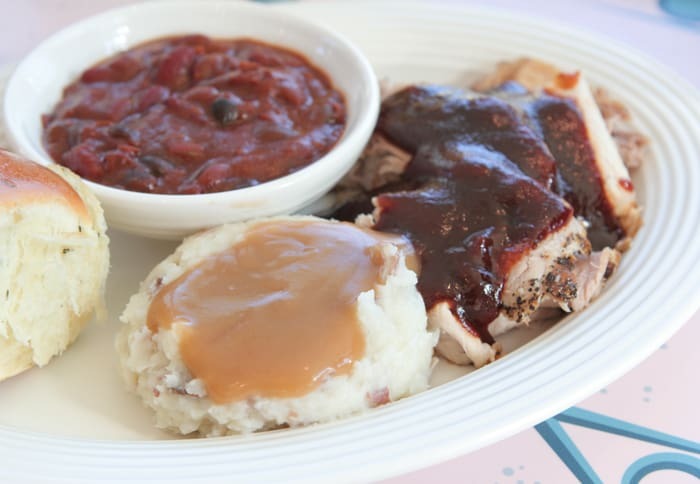 Here is the Pork Loin with Coca-Cola BBQ Sauce ($11.49) with Vegetarian Baked Beans and Mashed Potatoes as the sides. This was a good tasting dish that we recommend. The baked beans are not your typical, nevertheless decent, and the mashed potatoes where mighty tasty. 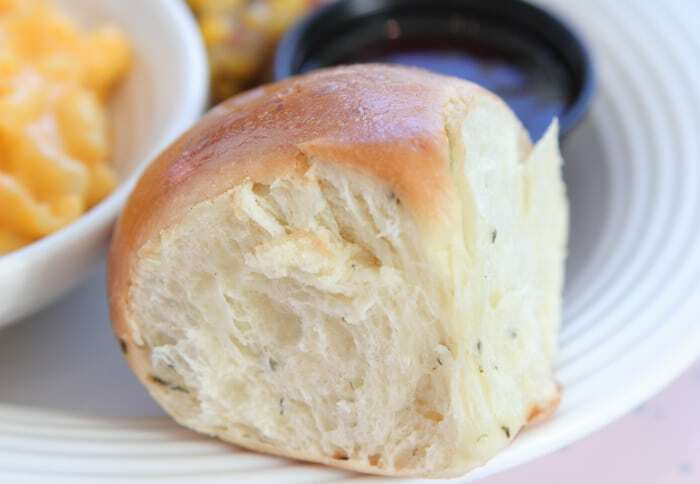 Here is their roll which was tough to keep on the table. 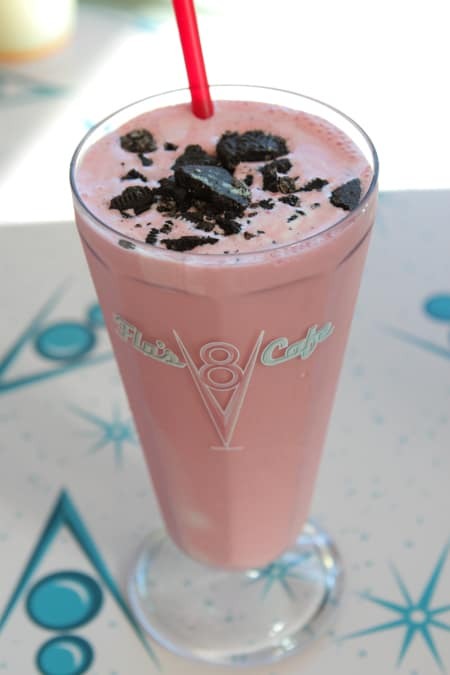 We had to photograph–code word eat–the Flo’s Classic Strawberry Shake in a Souvenir Glass ($9.59). Yes, we enjoyed! 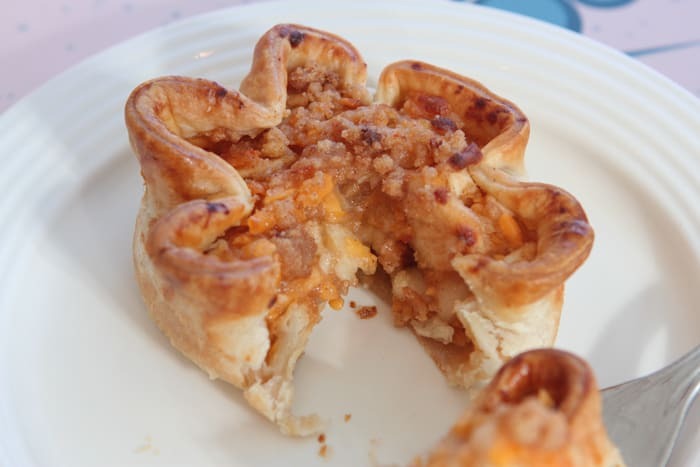 With three variations of pie to choose from, we opted for the Flo’s Signature Apple-Cheddar Pie-O-Rama ($5.19), taking the cashier’s recommendation. Once the outer shell was breached, the moist center was pleasant to the taste buds. 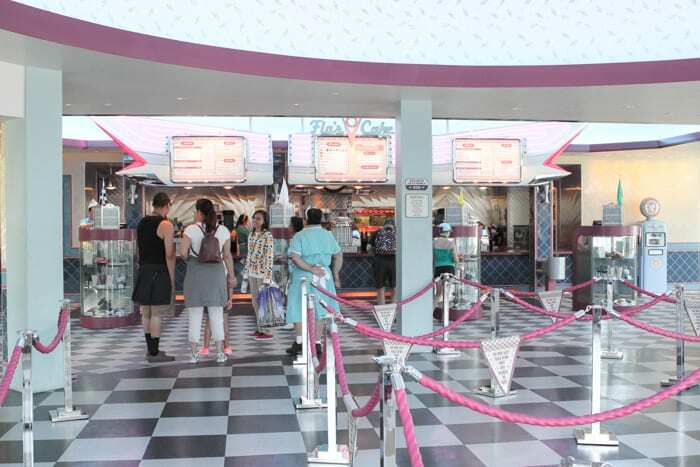 We love the decor at Flo’s V8 Cafe. 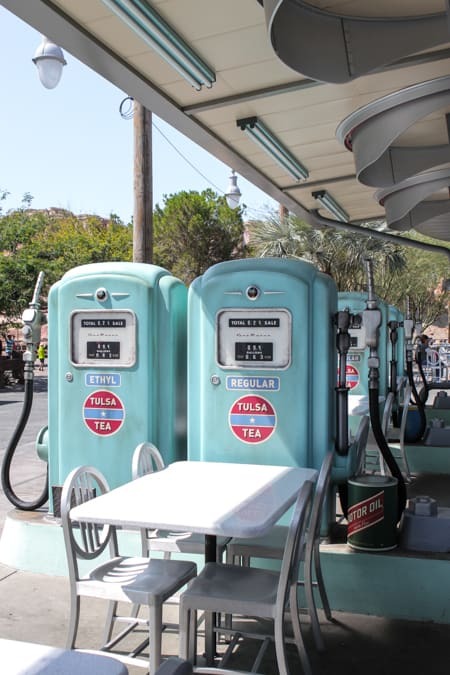 Disney did a nice job of bringing the old time feel to the dining experience. A view from the side of Flo’s V8. There were plenty of empty seats here due to the heat and not-so-busy crowd. 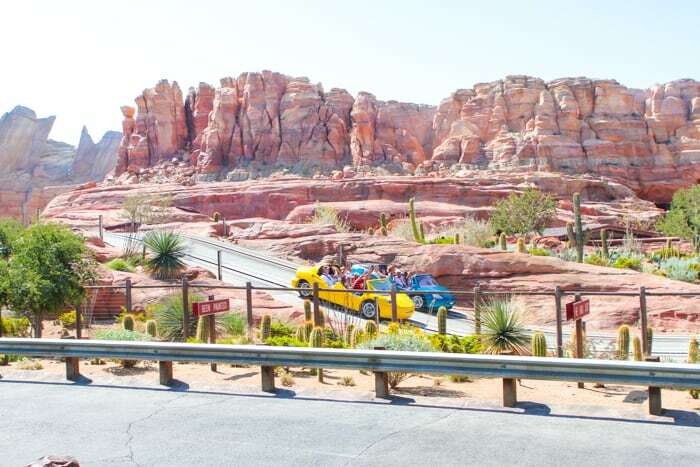 Opt for this spot in the winter and when lines get-to-a-backing up. 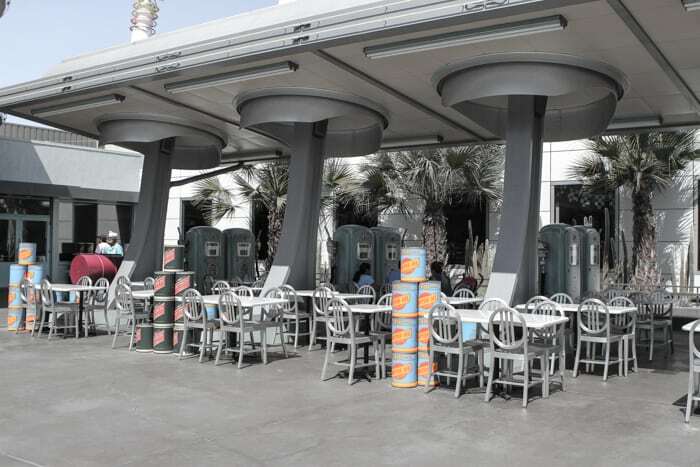 A view of the outdoor eating area which provides a view of the Radiator Springs Racer ride. This is a picture of the same seating area as above. 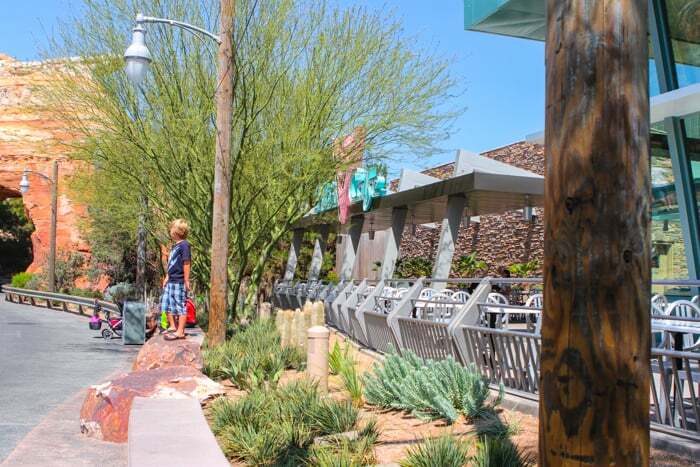 The shown path takes you to the Pacific Wharf dining area. When I (Cullen) see this picture I can’t help but whistle the theme to the Andy Griffith Show. Who’s with me now? 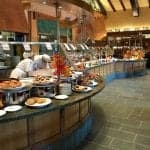 WHAT WORKED: The breakfast in dessert clothing Brioche French Toast, Chicken Tamale Breakfast, Oat Bran Muffin, Buckwheat waffles, Ice cream shakes, Ambiance. 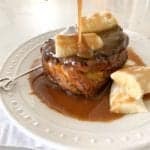 WHAT DIDN’T WORK: The small Oat Bran Muffin (wanted more), No option for 100% maple syrup, Over gravy-ized turkey and mashed potatoes–order gravy on the side. 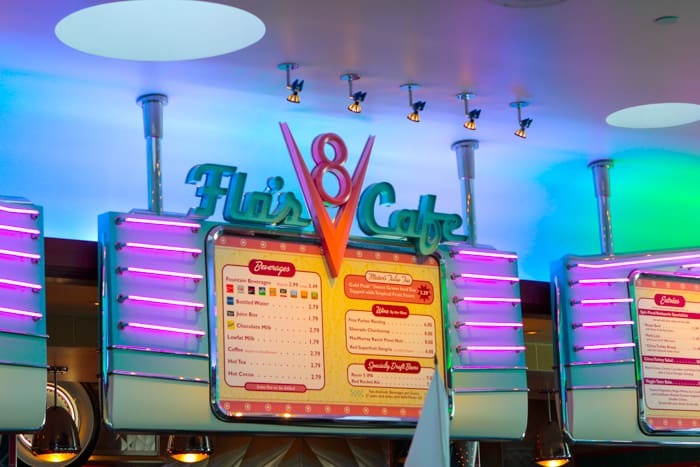 We give Flo’s V8 Cafe 4 STARS because of the better than average theme park food, ambiance, and delicious breakfast dishes. Flo’s menu has been changed. It has similar items, but they are served as sandwiches instead. Disappointing!